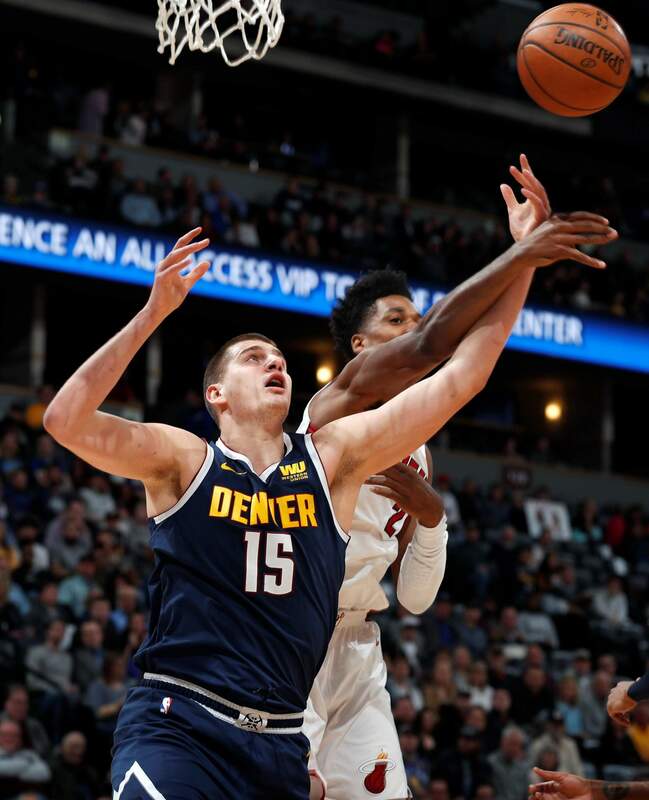 Denver Nuggets center Nikola Jokic, left, fights for control of a rebound with Miami Heat center Hassan Whiteside, right, in the first half of Monday’s game in Denver. 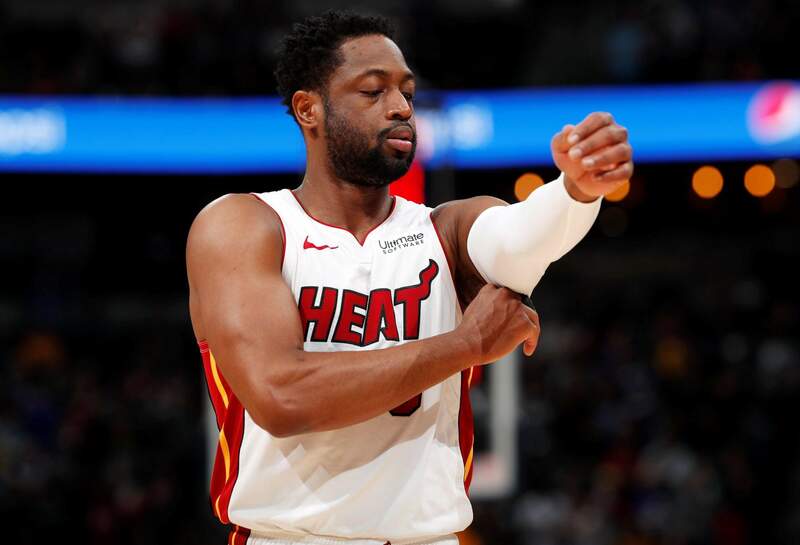 Miami Heat guard Dwyane Wade adjusts his sleeve as he takes the court against the Denver Nuggets in the first half of Monday’s game in Denver. 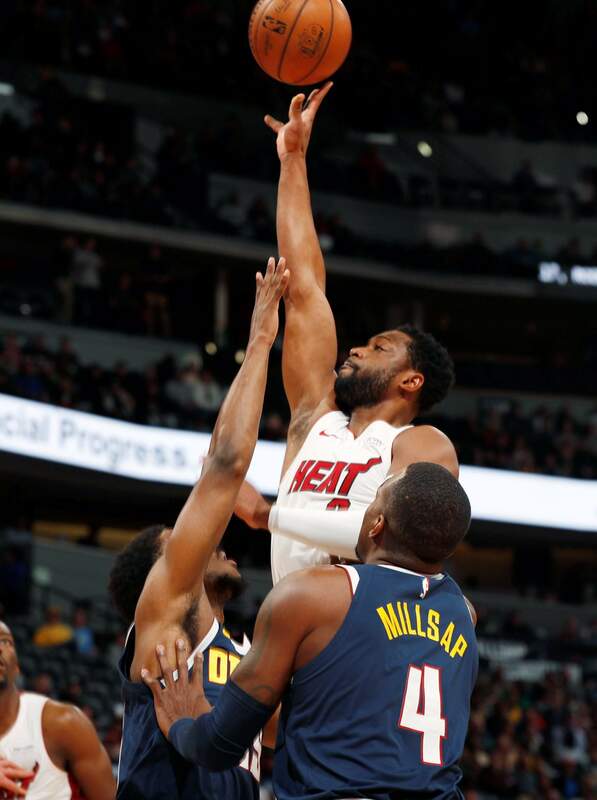 Miami Heat guard Dwyane Wade, center, goes up for a basket between Denver Nuggets guard Malik Beasley, back, and forward Paul Millsap in the first half of Monday’s game in Denver. DENVER – The Denver Nuggets halted a three-game skid by turning up their defense and turning things over to their deep guard rotation which will only get deeper when Gary Harris and Isaiah Thomas return to action after the All-Star break. On a night when Jamal Murray (3-for-12) wasn’t shooting well, two other guards stepped up. Not only did Morris score 17, but Malik Beasley chipped in 20. FATIGUE FACTORThe Heat scored 38 second-half points and shot 36 percent from the field. UP NEXTHeat: Visit Dallas on Wednesday night.